from more than 300 hotels and pensions in Tsugaike area? Tsugaike Kogen is located at the foot of the Ushiro-Tateyama mountain range in the Northern Alps, called the roof of Japan, and is the one of most popular mountain bases in Japan. And, Tsugaike Kogen is the snow freaks’ mecca for skiing and snowboarding in Japan. Also, the beauty of the mountains in the Northern Alps is highly acclaimed not only by tourists in Japan but also from overseas customers. All the staff are working on their daily work as a policy of “To help create memories of nostalgic travel that will remain in your mind through the nature of Hakuba”. We are holding The Star Watching Tour and Early Morning Scenic Tour of Hakuba daily. In addition, we plan and offer a variety of experience by the main theme of the seasons. We want to give all the guests a send-off with full of memories of precious trip and time. This is our heartfelt wish. Please leave it to me, Hiroshi Matsuzawa “The Professional of Mountain”, to making the mountain memories. I will take you to the hometown of the nostalgic mind. We have the only private bath in Tsugaike that can spend time precious time with your loved one. Unforgettable memories for you while relieve the weariness of mountaineering, hiking and trekking. Enjoy the very rare Cypress open-air bath and public bath with sauna, among the many hotels in Hakuba. We offer the cuisine, made wholeheartedly, with local seasonal foods in dinner. Enjoy the delicious and “easy on eye” cuisine, that is different from other hotels, and of the mountain resort in Shinshu and Tsugaike Kogen. The basic services and the cuisine are all the same! The basic services and the cuisine are all the same in all rooms. 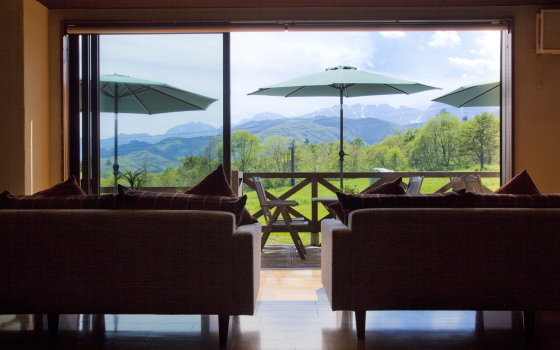 Enjoy the panoramic view and fresh air of Hakuba Mountains from terrace of the guest rooms in the North Alps side or enjoy the shopping and sightseeing by choose the reasonable rooms in the Street side. Choose the rooms freely by purpose of your trip. We offer variety of plans such as a plan to celebrate the anniversary with your loved ones or reflexology plan, plans for couples. And, we also offer variety of outdoor plans to experience the activities in Hakuba. The gondola station of Tsugaike Nature Park is conveniently located a 5-minute walk from the hotel. From the terrace and lobby, you can get a panoramic view of the Northern Alps which is ideal for photography and sketching. The hotel is located in a convenient place for trekking of Tsugaike Nature Park and Alpine plant photography or for staying before or after Mt. Hakuba mountaineering and Tateyama Kurobe Alpen Route Tour. We offer the outdoor plan that cannot experience in the city. Forget daily life in Hakuba Berghaus! Experience a feeling of floating in 20 meters up! Enjoy the panoramic view of Hakuba in the early morning and make precious memories with your families and loved ones. One of most popular activities in the summer! Let’s challenge the clear river of Shinshu with rubber boat! Fun of the canoe is skimming smoothly the surface of lake freely. You can watch fireflies in the same lake, and the tour using rafting boat is also held. The mystical light of fireflies in the silent lake offer extraordinary experiences. It is sure to be a memory of a lifetime. You can understand if you stay in our hotel that “Tsugaike Kogen Hotel Hakuba Berghaus” is a very Tsugaike exclusive resort hotel. And Tsugaike Kogen and the foot of Hakuba is a mecca of outdoor sports and the Northern Alps mountain tourism. Hakuba Berghaus is a special place where you can enjoy both the hotel and the outdoor. Explore Happo-ike Pond and Tsugaike Nature Park with your loved ones and experience non-daily activities such as hot air balloons and canoes. In Tsugaike Kogen, you can easily enjoy the experience that cannot experience in the city. And I, the professional of Tsugaike, know about outdoor and mountaineering of Hakuba inside out. I, owner Matsuzawa, will take you to the charms of Tsugaike Kogen and the best mountain resort in Japan with my responsibility. Please feel in relief and leave it to me. Our plan is made to provide the guests with best deals, we can accept a limited number of guests. Especially, popular plans will be filled up soon, so please make reservation early.